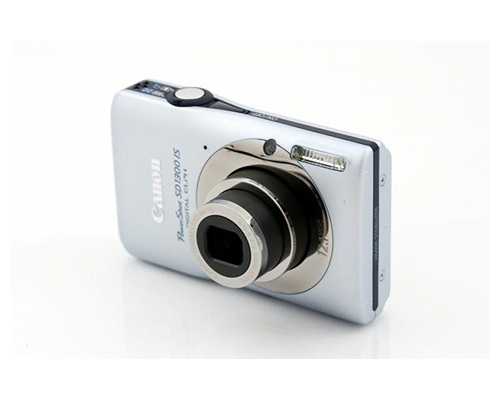 The Canon PowerShot SD1300 IS is a relatively low-cost consumer digital camera offering 12.1 megapixel photos and a 4x digital zoom that, like many Canon point and shoot digicams, prioritizes image quality over features, making it a good choice for the budget user who needs to be able to produce fairly good photos at a low price point. The SD1300 measures 3.56" by 2.2" by .83" and weighs approximately 4.94 ounces with its battery and memory card included, making it fairly standard in size alongside other consumer digicams currently available. The SD1300 includes a 2.7" LCD screen. The SD1300 captures images using a 1/2.3" type charge coupled device. It has a focal length of 5 (W) to 20 (T) mm, which is equivalent to a 35 mm film camera's focal length of 28 to 112 mm. It includes a 4x digital zoom and a focusing range of 1.2" to infinity (W) and 1.6' to infinity (T). Its macro focusing range is between 1.2" and 1.6' (W), and it includes a TTL Autofocus system. The camera supports resolutions of 320 by 240 and 640 by 480 for video. Stills can be taken between 640 by 480 and 4000 by 3000 depending on settings. The camera's maximum aperture is between f/2.8 (W) and f/5.9 (T), and it has a shutter speed between 1/1500 and 1 second, as well as a total shutter speed range between 1/1500 and 15 seconds. In Long Shutter mode, available speeds are 1, 1.3, 1.6, 2, 2.5, 3.2, 4, 5, 6, 8, 10, 13, and 15 seconds. It has automatic output sensitivity settings equivalent to ISO 80, 100, 200, 400, 800, or 1600. Light metering is evaluative and based on center-weighted averages, as well as spot, and exposure control can be done via Program AE, i-Contrast, and AE Lock. Exposure compensation functions in +/- 2 stops in 1/3 stop increments. The camera has White Balance Control options that can be configured automatically, customized, or set to presets such as Daylight, Cloudy, Tungsten, Fluorescent, and Fluorescent H.
Available shooting modes include P, Portrait, Night Snapshot, Kids & Pets, Indoor, Face Self-Timer, Low Light, Beach, Underwater, Foliage, Snow, Fireworks, Long Shutter, and automatic detection of settings. Photo effects include Vivid, Neutral, Sepia, Black & White, and custom settings. There is no wireless control, but a 2-10 second self timer is built in and the camera offers a continuous shooting mode at a rate of .9 shots/sec. The built-in flash can be set to automatic, Red-eye reduction, Red-eye Correction, Flash On, Flash Off, FE lock, and Slow Synchro. It has a range of 12" to 13' (W) and 1.6 to 6.6' (T) and a recycling time of 10 seconds or less. The camera supports storage media formats of SD, SDHC, and SDXC, as well as MultiMediaCard, MMC Plus Card, and HC MMC Plus Card. The camera captures still images as Exif 2.2 JPEG images and movies as AVI with monaural WAVE audio. Videos can last as long as 60 minutes or up to 4 GB per clip. It also includes a USB connector with an output for digital video and audio for either NTSC or PAL televisions and support for PictBridge-compatible printers, making it possible to directly print photographs without using a computer to do so. The camera is powered by a lithium-ion rechargeable battery pack. Its battery can only be charged externally via the supplied external charger, rather than inside the camera. Canon includes ZoomBrowser EX 6.5 and PhotoStitch 3.1 for Windows users and ImageBrowser 6.5 and PhotoStitch 3.2 for Mac OS. The camera cannot shoot HD video and lacks several other features offered by some other low-cost digicams. Available accessories for the PowerShot SD1300 include leather cases in grey, pink, and light blue, a standard case, a metal neckstrap, a waterproof case, additional battery packs, chargers, and cables. A High-Power Flash is available with a maximum distance of 23' at ISO 100 and f/2.8. Because this is a consumer point and shoot digicam, it lacks the additional lenses, filters, and connectivity options provided by SLRs and other cameras.